July | 2010 | What about this? July is almost gone now, but it was a month filled with the highs and lows of life. Milestone birthdays of 80, 83, and 88 years were joyously celebrated, but tempered with sad news from friends. July brought the reminder that life is to always be appreciated and celebrated. Lately I seem to be posting links to series of photos taken around the world, and, although I promised myself I would not do it this week, I am again linking to another series of photos. It features artistic skylines created out of a myriad of materials. Ever consider Jello as a building block before? Sorry, I find these types of things interesting! Every year at about this time, I take a close look at the ceiling fans in my home to see which way they are rotating. In the summer, ceiling fans should rotate in a direction that pushes the air downward. The fan blades should spin with the leading edge up and you should be able to feel this downward air flow by standing underneath it. For most, but not all fans, this means a counter-clockwise rotation. Another recent article in my local newspaper brought back memories for me. I wrote a post in April called What Not to Feed Your Pet and I thought it was a pretty comprehensive list, but the newspaper article listed a category that I had not included in mine. How could I have forgotten this one category?! One day when my little Romeo was just a pup, I came in from gardening and removed my shoes and thin nylon socks. I was reading the newspaper when I heard one of my sons say, “Mom, Romeo is sniffing your socks.” I continued reading the newspaper and calmly said, “Okay, keep an eye on him.” A split second later my son yelled out, “Mom, Romeo just ate your sock!” Well, my little dog was lucky that he didn’t need abdominal surgery, but boy was he a pathetic little thing after the veterinarian forced him to swallow charcoal and throw up the sock. Socks, underwear and nylons: Unsafe. Keep laundry picked up and in hampers, and always watch what your dog has in her mouth – especially during the chew-everything stages of growing up. Lesson learned for all of us that day. Please add socks, underwear and nylons to my What Not to Feed Your Pet list. It might save you some money on vet bills, but more importantly, it might save your pet’s life. 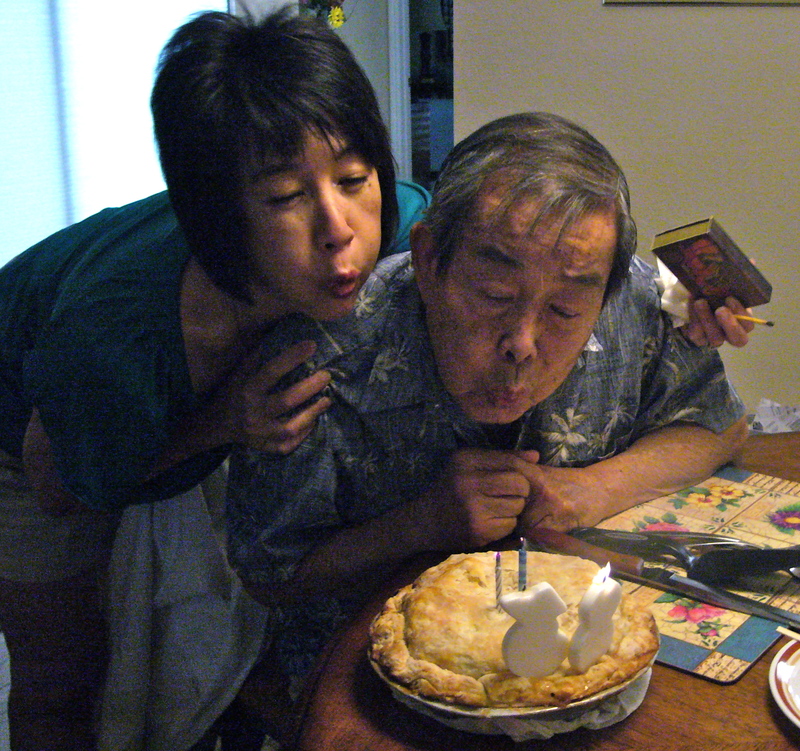 Today is a great day – it’s my dad’s birthday! Happy Birthday, Dad! I love you! Food always seems to taste better when you’re in Hawaii. 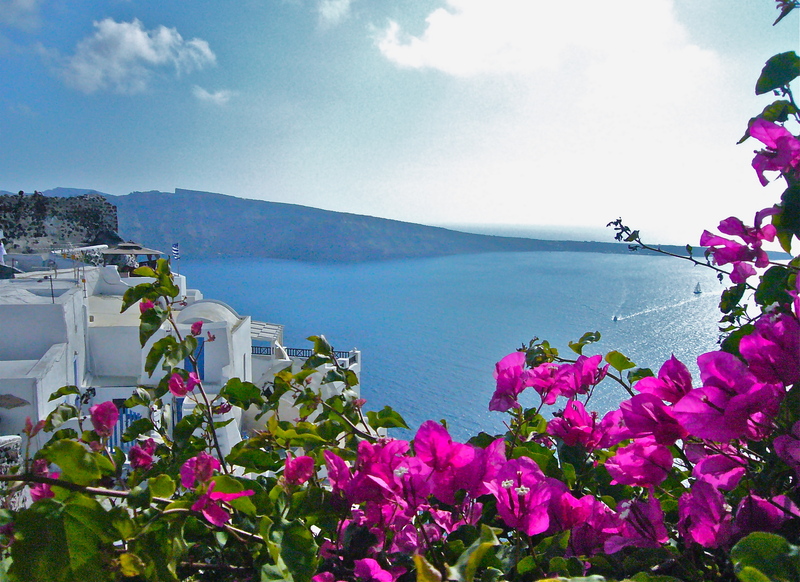 Exotic tropical flavors refresh our senses and remove us from our gastronomic ruts. 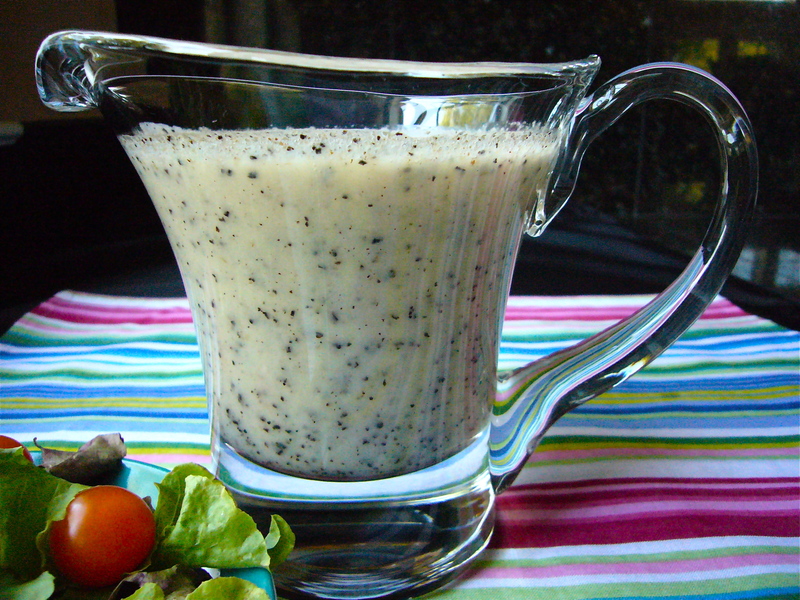 Here’s a salad dressing recipe that has Hawaiian origins, but can easily be made in anyone’s home. Not only is it a cinch to make, it uses normally wasted parts of a papaya – its seeds. Papaya seeds have a slightly bitter and peppery taste which adds an interesting element to the sweet-sour base of the dressing. My sister, who is a fabulous cook, gave this recipe to me decades ago. She was my “go-to” source for recipes when I was a young bride, and sometimes even now. 1. Cut the papaya in half lengthwise and scoop the seeds into a bowl. (If not using immediately, cover the bowl and put the seeds in the refrigerator until you are ready to make the salad dressing – hopefully within a day or two). 2. Place all ingredients into a blender. Blend until thoroughly mixed and smooth. Papaya seeds will resemble ground black pepper flakes. 3. Pour into a glass jar and chill for at least one hour before serving. 4. Shake or stir before serving. Don’t forget to eat the papaya! Put each papaya half on a plate and serve it with a wedge of lime. There’s nothing quite like the fresh taste of papaya and lime! With their buttery flesh, papayas are not only delicious to eat, they are also an excellent source of antioxidants (carotene, vitamin C, and flavonoids), B vitamins, potassium, magnesium, and fiber. 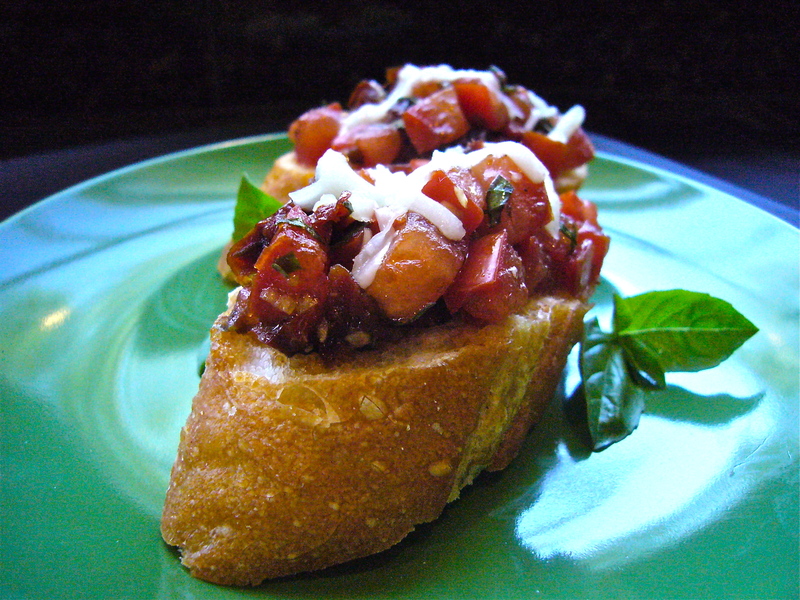 Bruschetta is a popular appetizer and snack served in central Italy. During the summer months, bruschetta (which is pronounced bruus-ket-ta) appears on many restaurant and home menus thanks to the arrival of vine-ripened summer tomatoes and fragrant basil. At a recent family gathering, one of my sister-in-laws brought a bruschetta that was different than most I’d had before. Her recipe uses two different types of tomatoes – vine-ripened Roma tomatoes and sun-dried tomatoes. I love the intense tomato flavor that this bruschetta offers! Buon appetito! Allrecipes is the original source of this recipe. 2. In a large bowl, combine the fresh tomatoes, sun-dried tomatoes, garlic, olive oil, vinegar, salt, and pepper. Allow the mixture to sit for a minimum of 10 minutes to let the flavors meld. 3. Chiffonade the basil by stacking the leaves, rolling them together lengthwise (like a cigar), and then cutting across the roll to create thin ribbons. Add to tomato mixture. 4. Cut the baguette into 3/4-inch slices. On a baking sheet, arrange the baguette slices in a single layer. Broil for 1 to 2 minutes, until slightly brown. 5. Divide the tomato mixture evenly over the baguette slices. Top the slices with mozzarella cheese. 6. Broil for 5 minutes, or until the cheese is melted. 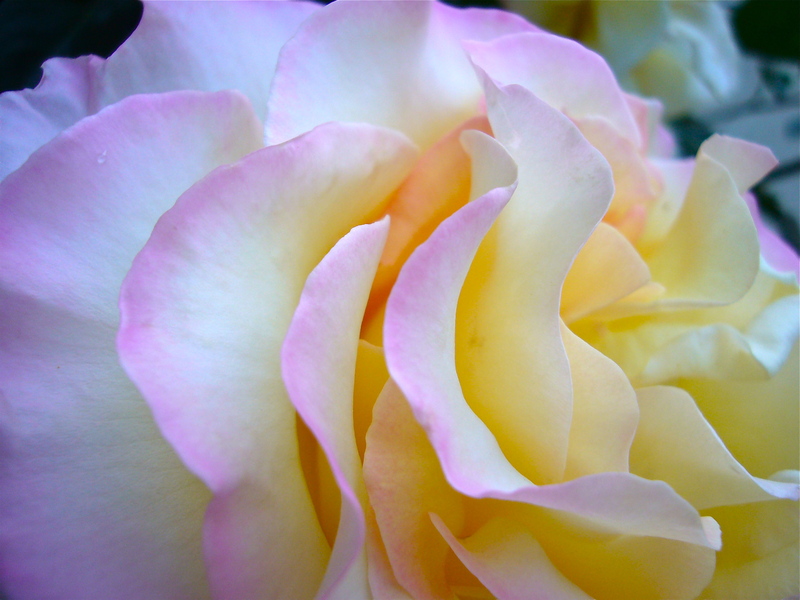 As I studied this photo taken in my garden of a Peace rose, I began contemplating on, how like the petals in this rose, achieving peace is a layering process. Whether it be inner peace or world peace, it takes layer upon layer – layers of the soul, layers of compromise, layers of human effort etc. – to collectively achieve the beauty of peace. Not one layer alone can create the same harmonious effect. #1 – Hallucinogenic Computer Art? My cousin left a comment for me about the computer doodling site I posted about in last week’s Friday’s Fresh Five!. She said it was hallucinogenic. Well, if that one made your mind swirl, check out this one! I used to subscribe to a magazine called Mental_ Floss, but dropped my subscription because I was drowning in magazines that I wouldn’t throw away. Now I pop in on its website to peruse the many fun articles aimed at tantalizing my brain! Here’s an article called 10 Notable Staircases you might enjoy. On Cut Out and Keep, another set-by-step craft tutorial site, is a tutorial for making handmade paper roses. Sheet music was used in the tutorial and the finished project was very cute. The directions are quite simple. Photos of other versions are also posted. My mind exploded with the possible uses for these roses and the types of papers that could be used for different effects! What about using these roses in lieu of bows on gifts – bridal shower gifts, wedding gifts, Mother’s Day gifts? Make these roses larger or smaller – the size is dictated only by the size of the hearts you cut out for petals. How about using Chinese newspaper for an Asian flair? To make cutting out the hearts/petals easier, I would recommend tracing around heart-shaped cookie cutters or using paper punches. I’ve been asked by many people about ways they can receive What About This? regularly. I certainly appreciate the dedicated followers of my blog! Thank you all so much! I’ve listed a few options below for you to choose from. If you have any problems with any of the options or have followed the steps and still do not receive What About This? in your email, please feel free to contact me. A. On my homepage on the upper right column is a box with “Subscribe and Get Email Updates!” Click on the link/small green words that say, “Subscribe to What About This? by Email.” That will take you to a window where you will type in your email address and a cryptic word. Click on the “Complete Subscription Request” button and you are done. B. Email me with the subscription address(es) that you want W.A.T? sent to and I will submit the information for you. C. Email me and ask me to put you on my mass mailing list, so that you will receive an email from me with a link to W.A.T? every time a new post is added. someplace, you are among the top 8% of the world’s wealthy. you are blessed because you can offer a healing touch. Bad news blares like an alarm and shakes my very existence. Within a short span of time I’ve received bad news from several people I care about. Too much all at once. Each person’s news is a reminder of the fragility of life and the ever teeter-tottering balancing act of happiness. These bits of news are wake-up calls that cry out for life lessons to be revisited. In the blink of an eye, life can change. 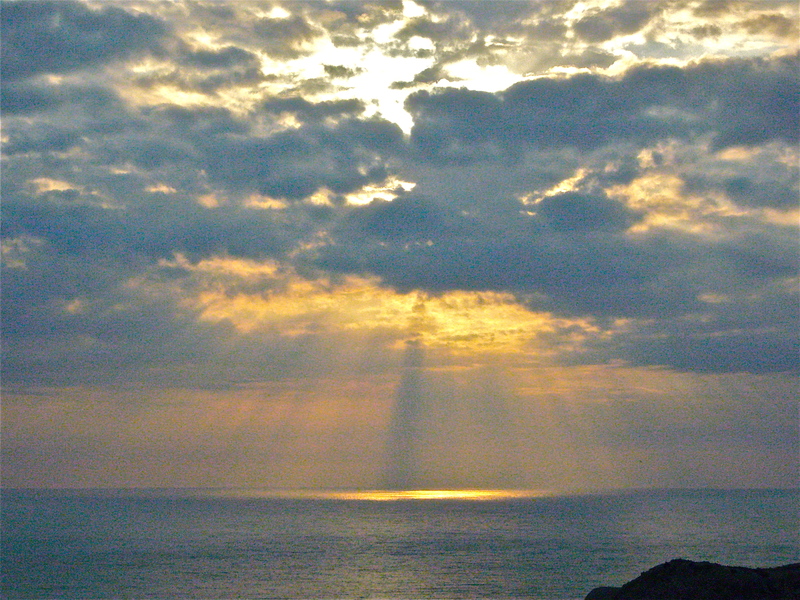 I’m acutely aware of that – savoring joy and living in the moment are underlying themes in many of my posts. Still, I let my guard down occasionally, complacency slides in and auto pilot takes over allowing life and happiness to be taken for granted. I’m sure there are countless others like me who need to be shaken awake from time to time by life’s wake-up calls. Most of us let the details of our every day lives consume and control us to the point were life’s big picture is no longer in focus. We sweat the details and deny ourselves moments of joy. In my post On a Need to Know Basis I wrote about learning a life lesson when one of my cousins fell ill and passed away. I tell many of my friends, who fret and worry over their children’s grades, S.A.T. scores, and such, about how my cousin’s story has always helped me keep life in perspective. My cousin was close to finishing his freshman year in college when he became ill. Before he slipped into a coma and died he told his dad that he was sorry about his grades. My aunt and uncle are not unreasonable people. Like most of us they had hopes and dreams for their child and they pushed him to study hard. They never imagined that his last words to them would be about grades. We would all probably agree that in the big picture of life, grades aren’t really that important, but yet we can all probably relate to getting caught up in the details of grades. Put the details of whatever makes you angry, sad, frustrated, worried etc., into proper perspective – or whole life perspective – and see if that doesn’t change your outlook on life a little. Paint the big picture of your life in your mind and what do you see? What is important enough for you to include? What should you be grateful for? It takes practice and daily awareness to live a grateful life. Life is all about making choices. We have no control over certain aspects in our lives, but we can choose how we react and interact. As we go about our everyday tasks or write out our daily “To Do” lists, we must make sure we don’t forget to find some way of showing gratitude. Acknowledge people that support you in your workplace or in your community, find the positive in your job, be grateful for your health, tell your kids you are proud of them, and so on. We should make sure that the messages we are sending to those we care about come out loud and clear. The “unsaids” should be said more and the “saids” should be said less. The best intentions left undone are often ” I should of . . . ,” “I wish I had . . . ,” ” I was going to . . . .” Don’t miss the opportunities in life to show your thoughtfulness or gratitude or that you care. Don’t wait to be shaken awake again. This post is dedicated to the memory of Steve Strann, a loving husband, a doting father, a fun neighbor, and a most wonderful friend who’s forever changed my outlook on pelicans, squirrels, orchids, and all things electronic. Crisp and colorful are words that easily describe this salad. 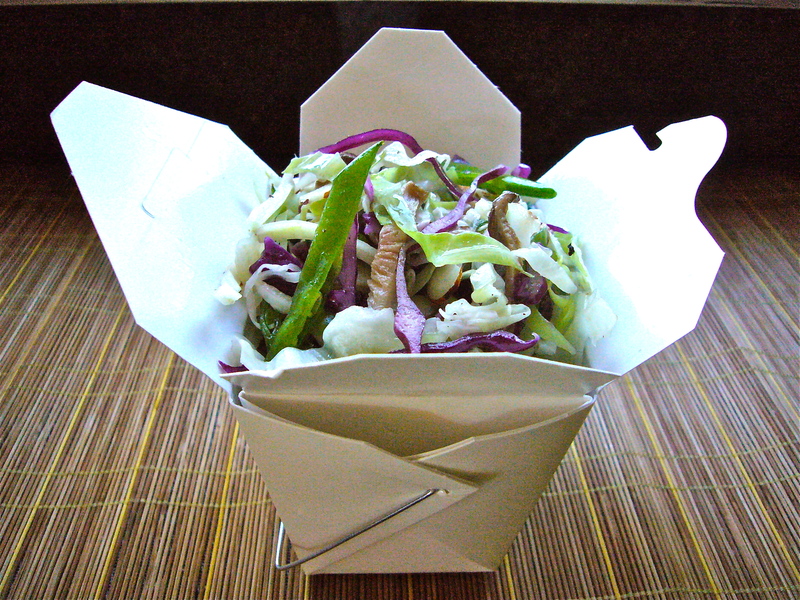 Two bright colors of cabbage are combined with vibrant greens of pea pods and green onions and then topped off with the textures of Shitake mushrooms, water chestnuts, and toasted almonds. Drizzle and toss with an Asian vinaigrette and you have the perfect Asian summer salad! This is my adaptation of a recipe I received from a sister-in-law more than a decade ago. Enjoy! 1. Combine the vinaigrette ingredients into a glass jar and set aside to allow flavors to meld. 2. Cut cabbages into quarters and slice off core. Thinly slice each quarter into very thin ribbons. Measure and put into large bowl. Note: You will have more cabbage than you will need. Reserve it for another dish or make a double batch. 3. Slice the stems off the Shitake mushrooms and discard them. Slice the mushrooms into thin slices and add to bowl. Note: if you cannot find fresh Shitake mushrooms, you can rehydrate dried Shitake mushrooms instead. 4. Slice the snow pea pods into diagonal strips and add to bowl. 5. Drain can of water chestnuts and add to bowl. Note: Even though I buy sliced water chestnuts, I sometimes slice these into strips to keep all ingredients uniform in appearance. Whether I do this or not is usually dependent on how much time I have! 6. Slice green onions and add to bowl. 7. To bring out their flavor, toast sliced almonds by spreading them out in a baking pan and toasting them at 350 degrees for about five to ten minutes, stirring occasionally. Keep an eye on them so they don’t burn. Cool completely before adding to salad. Note: If you don’t like almonds, you can always sprinkle the salad with toasted sesame seeds. 8. Toss salad components together. Shake jar of vinaigrette and pour a small amount on top of salad ingredients. Toss. Add more vinaigrette if necessary. Note: You will likely have leftover vinaigrette.